“¡Ya Basta!” ("Enough is Enough!") declared the EZLN (Zapatista National Liberation Army - named after the Mexican revolutionary Emiliano Zapata), as they burst to international attention on New Years day 1994. The rebellion started in San Cristobal de las Casas, Chiapas, Mexico in the tradition of all peasant armies: ransacking town halls and burning land deeds! Destroying 10 government offices, freeing 179 prisoners, then attacking an army garrison, and in one town shooting down an army helicopter, and torching the town hall before quietly slipping back into the jungle. The timing for the international “audience” was crucial, coinciding with the controversial introduction of the North American Free Trade Agreement. It didn’t take long for the state to respond, on January 4th ten towns near San Cristobal were bombed, 400 people died. On the 5th tanks arrived in the area along with more troops, yet more died. The government began to distribute black propaganda, and prevent human rights organisations entering Chiapas. The EZLN then withdrew to the jungle, and a tense ceasefire began on January 12th. Since then the Mexican army has been using a tactic of low intensity warfare (killing and displacing civilians), which continues to this day. The Zapatistas have organised international “encuentros” attracting thousands of people from around the world which have been influential on the global anti-capitalist movement. The Zapatista uprising has allowed over 1,100 communities in Chiapas of 300-400 people to organise federally into 32 autonomous municipalities where power lies at the base. Local decisions are taken at a local level and important decisions are made at a wider regional or municipal level, discussions continuing until something like consensus is reached. In these areas the people have much more control over their lives than before and women can play a much bigger role than traditional society allowed. On the negative side the EZLN is hierarchically organised with officers of different ranks and high profile leaders. Their stated aim is a programme offering little more than liberal capitalism and it’s even backed up by appeals to the Mexican constitution. Nevertheless, the struggle of the peasants in Chiapas has been inspirational to many people around the world and we send our solidarity to all those struggling for freedom and equality in Chiapas. 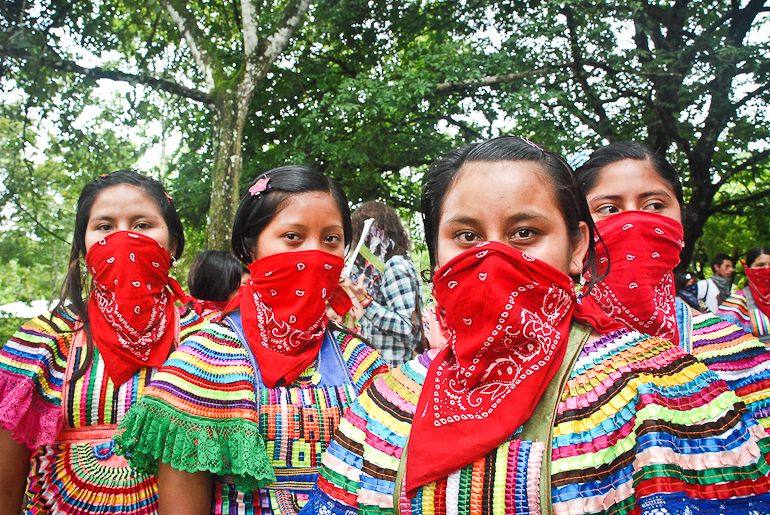 The EZLN is hierarchically organised. But the societal structures don't seem to be. Militias need to be hierarchical (however, democratically hierarchical) or else they are inefficient. And how are they aiming at "liberal capitalism"? Militias need to be hierarchical (however, democratically hierarchical) or else they are inefficient. Isn't that what the Stalinists said about the anarchists and the POUM in Spain '37? The EZLN is hierarchically organised. But the societal structures don't seem to be.